Are you wondering how to display all the beautiful illustrations you’ve bought? Having mostly white walls and grey walls in our home, I’m forever looking for inspiration to decorate our walls and this monochrome wall display in Trendenser‘s office remains my all-time favourite! The first image above stopped me in my tracks because I have a nice collection of monochrome prints and now that we have black floorboards in our loft conversion, I can see how visually striking such a display would look in the room. The second example features an interesting & eclectic mix of prints, photography and stuffed animals. I know for some taxidermy is an art and I’ve seen some beautiful things in antique shops but I can bring myself to hang on in my home, would you!? The example below is a picture from our home in London before the renovations…a mood board made of monochrome illustrations, black & white family pictures and drawings from Mila. If you can’t face drilling into your walls too many times, these picture ledges from Ikea are not only a godsend but they are also inexpensive and can be painted to blend with the colour of your walls. You can then hang them in your lounge, hallway or home office to display picture frames and small knick-knack. And then there is the way you mix things together. Personally I think wall decoration looks way better when you start mixing small and big picture frames. It just does feel more homey, don’t you think? Which example do you like the most? Which one could you see in your home? 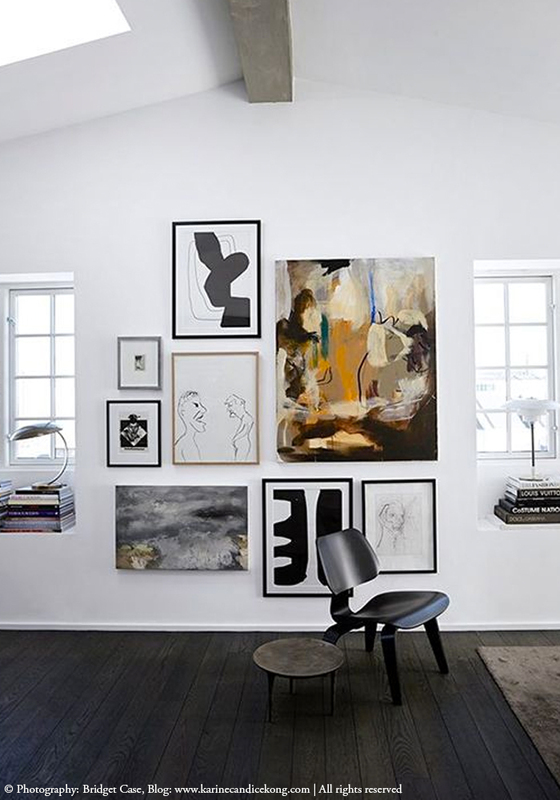 1st picture, great balance black floor and white wall with the drawing/paintings. Love it! I love this! Especially like art that’s hung close to the floor. I think it’s very modern and visually interesting. The art of the hagging art! Just love it! Great job. Displaying art is no easy task.